Another Misuse of Standardized Tests: Color Coded ID Cards? An October 4, 2011 Orange County Register article that reports a California high school’s policy to color code student ID cards based on their performance on state exams raises several real concerns, including student privacy. Anthony Cody in his blog post “Color Coded High School ID Cards Sort Students By Test Performance” published on October 6, 2011 in Education Week Teacher writes that “[s]tudents [at a La Palma, CA high school] who perform at the highest levels in all subjects receive a black or platinum ID card, while those who score a mix of proficient and advanced receive a gold card. Students who score "basic" or below receive a white ID card.” These cards come with privileges and are meant to increase motivation to perform well on state standardized exams. Followers’ comments and concerns posted to the blog address “fixing identity” and that testing conveys the idea that “learning and achievement isn't reward in itself. … You're not worth anything unless WE tell you are based on this one metric.” These are valid concerns, but the larger issue being highlighted here is the misuse and misapplication of the standardized tests themselves. It has been just about six months since I closed up my classroom in sunny Southern California, picked up my life, and moved to Bloomington, Indiana to pursue my PhD in Learning Sciences. I can say that a year ago I certainly did not think I would be posting on a blog about Re-Mediating Assessment. I didn't think I would writing up my research or be helping teachers develop and discuss curriculum that fosters more participation and learning in their classroom. But here I am. In fact, a year ago I was celebrating Banned Books Week with my AP Language and Composition and Honors 9 English classes, preparing my Mock Trial team for another year of success, starting a competitive forensics team, chairing the AP department, and generally trying to convince my colleagues that my lack of “traditional” tests and use of technology in my almost-paperless classroom were not only good ideas, but actually enhanced learning. A year ago I was living life in sunny Southern California as normal ... then I decided to take the GRE. And I am so glad I did. It has been an interesting journey getting to this moment. I never thought I would become a teacher. I have an AA in Dance, an AA in Liberal Arts, and a BA in Theatre Directing, but I found that working in the top 99 seat theatre in Los Angeles left me wanting more. When I went back for my MAEd and teaching credential, I was the only one who was surprised. Teaching students, I learned, is very much like directing actors - we want them to come to conclusions, but they need to come to them in their own way in order for the outcome to be authentic. I have worked as a choreographer, director, and actor. I have taught 10 minute playwriting and directed festivals, as well as developed curriculum around this theme. I studied Tourette Syndrome under Dr. David Commings at the Beckman Research Institute at City of Hope, and informally counseled TS students at the high school. I am a classical dancer and recently picked up circus arts as a hobby. Each of these very different interests contributed to my teaching. We explored literature through discussion, and often took on the roles of the characters to discuss what a piece said about the society in which it was written and its relevance today. Quite often administrators walked in while students were debating the ethics of the latest redaction of Adventures of Huckleberry Finn or discussing Fitzgerald’s symbolism while dressed to the nines at a Gatsby picnic. Still, I came up against resistance when presenting my methods and ideas to my colleagues; they didn't think that I was teaching if I wasn't giving traditional tests. I had too many A's and too few F's. I knew that I could affect greater change, but I wasn't sure how. Then the opportunity to come to Indiana University and work with Dan Hickey arose, and I had to take it. Now I am in Bloomington, reflecting on a semester of writing, learning, studying, and creating curriculum. I have immersed myself in the school and culture and work here, and have found smaller networks of people with whom I can engage, play, think, debate, and grow. I am excited and encouraged by the adventures that await in this chapter, and am looking forward. After an extended hiatus, Re-Mediating Assessment is back. In the meantime, lots has happened. Michelle Honeyford completed her PhD and joined the faculty at the University of Manitoba in Winnipeg. Jenna McWilliam has moved on to Joshua Danish's lab and is focusing more directly critical theory in new media contexts. She renamed her blog too. Lots of other things have happened that my student and I will be writing about. I promise to write shorter posts and focus more on commentary regarding assessment-related events. I have a bunch of awesome new doctoral students and collaborations who are lined up to start posting regularly about assessment-related issues. "This is an extraordinary book. 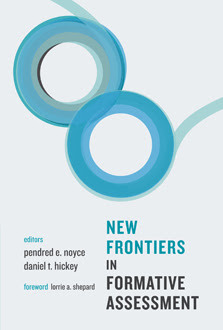 The chapters cover practical applications of formative assessment in mathematics, science, and language arts, including the roles of technology and teachers’ professional learning. I found my own thinking about formative assessment constantly being stretched and challenged. Anyone who is involved in education will find something of value in this book." Lorrie Shepard's foreword is a nice update on the state of assessment. David Foster writes about using the tools from Mathematics Assessment Resources Services in the Silicon Valley Mathematics Initiative Dan Damelin and Kimberle Koile from the Concord Consortium write about using formative assessment with cutting edge technology. (And we appreciate that the Concord Consortium is featuring their book on their website. For me the best part was the chapter from Paul Horwitz of the Concord Consortium. Paul wrote a nice review of his work with Thinker Tools and GenScope and the implications of that work for assessment. Paul's chapter provided a nice context for me to summarize my ten year collaboration with him around GenScope. That chapter is perhaps the most readable description of participatory assessment that I have managed to write. A much more detailed account of our collaboration was just accepted for publication by the Journal of the Learning Sciences and will appear in 2011. I promise you will be hearing from us regularly starting in the new year. We hope you will comment and share this with others. And if you have posts or links that you think we should comment on, please let us know. I will let the rest of the team introduce themselves and add their bios to the blog as they start posting.